That's a good practice method. If you're able to, varying the ranges kicks it up a notch! just start crazy-close, where you can't possibly miss, and put a good half dozen arrows or more into your target. Then just keep backing up through the session, making sure to stay just at the edge of where you can reliably put the arrows where you want them. Getting a feel for range just sort of falls out naturally from doing it. It's a technique pretty dependent on already having consistent form, but it's a great warmup. Elleth wrote: Interesting! Very well done! 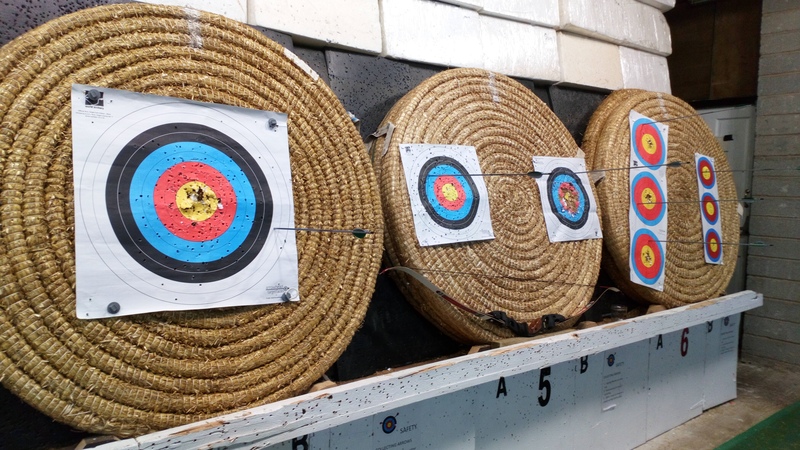 I'm curious about the culture at your archery range: do they usually go for pure target shooting? Do they use modern or traditional bows? Sights? One place I think "Ranger archery" differs from both target and hunting archery is that "good enough and fast" usually trumps "precise but slow." Plus the odd positions and angles hunters deal with, of course. I'd *think* that at an archery club it wouldn't be hard to find a group of people who also thought that our take on the game was fun. But I imagine that's local culture as well. Elleth wrote: I'm curious about the culture at your archery range: do they usually go for pure target shooting? Do they use modern or traditional bows? Sights? Elleth wrote: One place I think "Ranger archery" differs from both target and hunting archery is that "good enough and fast" usually trumps "precise but slow." Plus the odd positions and angles hunters deal with, of course. Agreed, plenty of times someone at the club has quietly said to me "you know you shoot to fast, you'd be much better if you slowed down a bit" and there probably right, although If I got use to slow I may never be able to speed up? It's never been my intention to get a high score, just to enjoy myself. The other thing that bugs me is people who know your into LOTR who find out you do archery and automatically think you can shoot like Legolas does in the movies, I mean, I don't think anyone can shoot like that? Dunno if that helps you, but it was an eye-opener for me. After FOTR released, I and a friend's daughter were playing around with some of the trick-shots. I actually got halfway decent with the double-arrow thing. There's a trick to it, and obviously it's nowhere near as accurate, but you can still pretty reliably put a couple arrows at once into the width of a torso at short range. ... that said, since it's two arrows coming off the same string, they each hit half as hard. Elleth wrote: After FOTR released, I and a friend's daughter were playing around with some of the trick-shots. I actually got halfway decent with the double-arrow thing. There's a trick to it, and obviously it's nowhere near as accurate, but you can still pretty reliably put a couple arrows at once into the width of a torso at short range. Thank you and yeah, that's the other thing about club ranges, your only allowed to shoot in threes, and even if you can shoot six in the time it takes someone else to shoot three so your not actually holding anyone up, you still get glared at if you shoot more than three??? Oh right! Yes that law always seemed odd to me. Especially when you consider the history of England and the importance of the bow. But I always thought it was just a hunting related law? Or are you worried that if you carry a bow around in the forests they will just assume you were trying to hunt? ... unfortunately, most shooters stop progressing when they become competent with the gap shooting method..... and that's what trips them up. Imagine a deer hunting situation. It's getting dark. A deer in light cover exposes its rib cage. Is it 20 paces or 30 paces? You're at full draw: can you see the gap? Probably not, yet the difference in 10 paces is 10 inches in gap. Also, your arrow now has a broadhead instead of the field point you're accustomed to seeing in practice. The broadhead is more difficult to pick up in your peripheral vision. I've nowhere near the expertise to evaluate what he says, but in my very limited experience... it rings true. I've a vague memory of a "gap shooting" period in my development, and it was more...awkward? It felt more precise at the time, but looking back it was overly limiting.